After ten days, four states, hundreds of miles along I-10, three hotels, sand, surf & sunburns, amusement parks, shuttle launch viewing (um...not so much) and loads of junkety junk food my people and I have returned home. 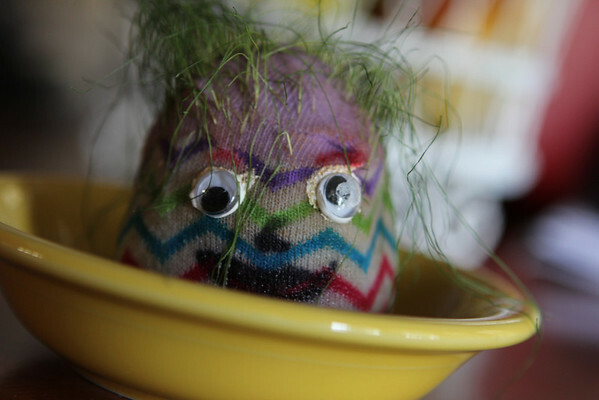 That's Annelise's creepy sock grass head she made at school for Easter. But I kind of feel like it looks. But it feels really good to be home too. Somewhere between all the laundry, grocery shopping, cleaning (this time I left without vacuuming, gasp! the horror! ), errands, photo editing, mandatory workouts and necessary make-up DVR viewing I'll be back with all the nitty gritty deets from Road Trip 2011.
glad you all had a great trip and arrived home safely! Home Sweet Home! Wow, that sock grass dude is hilarious. Glad your road trip was a lot of fun! I am so ready to throw that ugly grass head away but Annelise would freak. She waters it every day. Sigh.